Right from the moment I first saw him, it was obvious. Handsome, chic, large and not at all pretentious. Discreet, yes discreet but not overly: it’s best it’s known that we’re together! Perfect with jeans, great with a jacket, and just sublime with an evening outfit. With him time never passes too quickly or too slowly. Just at the right tempo. The others are not jealous… Well just a teeny bit. I don’t have him UNDER my skin but ON it, just on the surface, which makes me smile all the time. I feel strong and confident. It’s not that I feel more beautiful; I just have the impression that the whole world is a more beautiful place. I tell myself it’s simpler to wear something on my wrist to have more confidence in the future. 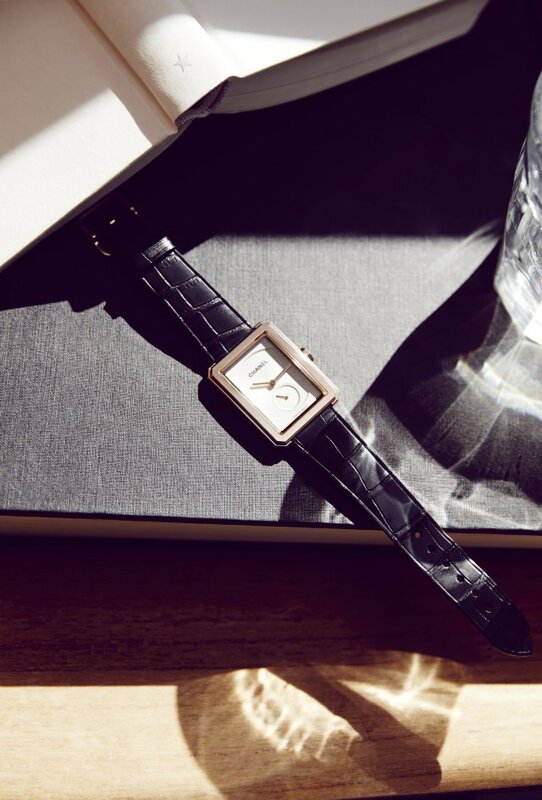 And here it is: the BOY.FRIEND watch – a fresh, newly intriguing creation signed CHANEL. A watch with a masculine allure, but for ladies only. A declared intimate relationship with one of the most coveted among the masculine wardrobe’s items: his watch. A watch which, once stolen, makes a woman feel special. A watch that represents her man, always “touching” her skin. An exclusive feeling of belonging. Playing with the masculine accessories and wardrobe, which used to be so dear to Mlle Chanel, is reinterpreted today through a concept which brings to life Place Vendome, the legendary N°5 perfume bottle while suggesting the powerfully iconic PREMIERE watch: all in the octagonal shape of the watch case. A watch of the outmost simplicity, sleek elegance and powerful presence. Classic and modern at the same time, for a timeless image which will always stay perfect. Being all in the details, the BOY.FRIEND watch comes in two bold yet balanced and proportioned sizes: the XL model (37 x 28.60 mm), equipped with a manual-winding mechanical movement and a small second counter at 6 o’clock; the L model (34.60 x 26.70 mm), equipped with a quartz movement and the small second counter. BOY.FRIEND watch. 18K BEIGE GOLD case. 18K BEIGE GOLD bezel. Opaline guilloché dial. 18K BEIGE GOLD crown and onyx cabochon. Black alligator strap with 18K BEIGE GOLD buckle. Manual-winding mechanical movement. 42-hour power reserve. Functions: Hours, minutes, seconds. Water-resistance: 30 meters. Dimensions: 28.60 x 37 x 7.75 mm. BOY.FRIEND watch. 18K BEIGE GOLD case. 18K BEIGE GOLD bezel set with 64 brilliant-cut diamonds (~0.71 ct). Opaline guilloché dial. 18K BEIGE GOLD crown and onyx cabochon. Black alligator strap with 18K BEIGE GOLD buckle set with 48 brilliant-cut diamonds (~0.28 ct). High-precision quartz movement. Functions: Hours, minutes, date. Water-resistance: 30 meters. Dimensions: 26.70 x 34.60 x 7.33 mm. BOY.FRIEND watch. 18K white gold case. 18K white gold set with 66 brilliant-cut diamonds (~0.92 ct) . Opaline guilloché dial. 18K white gold crown and onyx cabochon. Black alligator strap with 18K white gold buckle set with 48 brilliant-cut diamonds (~0.28 ct). Manual-winding mechanical movement. 42-hour power reserve. Functions: Hours, minutes, seconds. Water-resistance: 30 meters. Dimensions: 28.60 x 37 x 7.75 mm. Post edited by Claudia Carletti, Jewellery Through Time. All material courtesy of Chanel Press Office.